Does your child have problems turning their arm so their palm is up? This movement is called supination and many children with hemiplegia or hemiparesis have problems with supination of their affected hand. Here are some fun ways to encourage your child to supinate his or her hand. Start with the goal of helping your child move her hand to “neutral” as if shaking hands. Ringing water out of a towel by twisting it. “Guess which hand” games, where something is hidden in one hand, the partner guesses which by tapping the guessed hand, and the hider turns both palms up and opens her hands. If correct the guesser gets a point. If not, the hider gets the point, and so on. 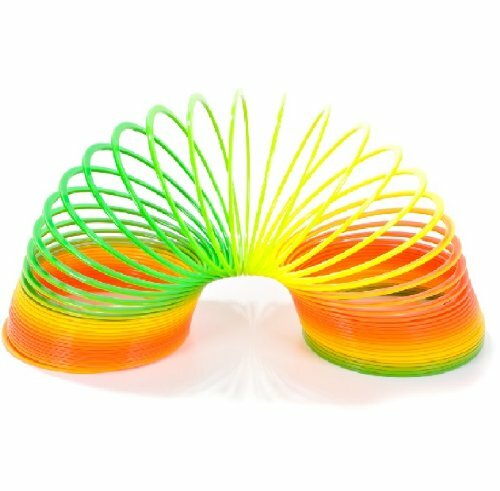 A simple “Slinky” is a great toy to encourage supination. Hold the slinky in both hands and move it side to side. Build with cones. Build towers or set them up for “bowling”, etc. If you place or the child grasps the cone closest to the thumb, the child has to actively supinate at least to neutral to effectively place the cone. For older kids, grasping a magnet (adapt type and size to the child’s needs) and guiding a magnetic “car” along a path (the path is drawn on oaktag or similar thin but sturdy paper). The path is held with the non-affected hand and the child holds the magnet in the affected hand, under the path to guide the car. Benik splints with the supinator straps can help, especially for children with some active supination. Sand or water play. Scooping up sand or water and pouring into another container or a sand/water wheel toy. Making sand castles uses the pronation/supination. Same with snow. A snack activity such as scooping and eating pudding. Placing stickers or stamps on the inner arm – turn to look at it. Playing with money and reaching for change. Fill plastic Easter eggs with varying items; the easier it is to make a sound, the easier the child needs to work. Things that don’t make sounds easy make the child work harder. You can actually do a number of motions with these. Supination to pronation, flexion to extension of either the wrist or the elbow, and crossing the midline. Send your spination ideas to CHASA using the Contact Us Form.